A cousin to a pizza, don't miss this Alsatian treat! We kept seeing tarte flambée (Flammekuecheon in Alsatian) on menus and pictured a flaming pie emerging from the kitchen. Turns out that's not it at all. It's apparently called a tarte flambée because it's traditionally made in a very hot wood stove, with lots of flames. But the tarte itself doesn't flame. We were not disappointed, however, once we tasted this delicious Alsatian treat. 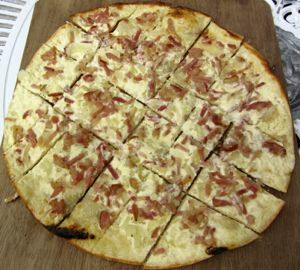 Similar to a pizza or a flatbread, but with a very thin, crisp crust, a tarte flambée makes a great entrée (starter) for a couple of people to share, or a delicious lunch, along with a side salad. The traditional tarte flambée (sometimes called "nature") is topped with crème fraîche, onions, and lardons (bits of slab bacon), and it's delicious. You can also get other versions, such as forestière, with mushrooms; munster, with that local cheese; or gratinée, with gruyere cheese. We were so taken with the original that we stuck with that. We were told that the best tartes flambées were found in the villages along the Alsatian Wine Route. Based on what we sampled in Ribeauvillé, we'd have to agree! Above, Yum! A delicious tarte flambée, hot from the oven. With three of us sharing it as a starter, it didn't last long!